Pokhara is situated about 130 miles west of Kathmandu and sits just south of the vast and might Annapurna Mountain Range. It is Nepal's second largest City with a population of just over 250,000. The flight from Kathmandu takes about 40 minutes, but allow for delays at the Airports. Although an internal flight, you are still required to show your Passports to the Airport Authorities. You can also travel from Kathmandu to Pokhara by Bus. This is the much less expensive option and you get to see some wonderful scenery along the Prithvi Highway. Journey time though is around 8 hours. There are several points of interest around the City. The Devi Falls, known locally as Patale Chhango (Hell's Fall), is where the rushing waters from the Phewa lake drop down into a deep Cavern. You can see it both from the outside at the top, then go over the Road and drop some very steep stairs into the Caves below. This is quite a long drop, it's very hot and humid, so not for those with Heart or Respiratory problems! The Gherka Museum. 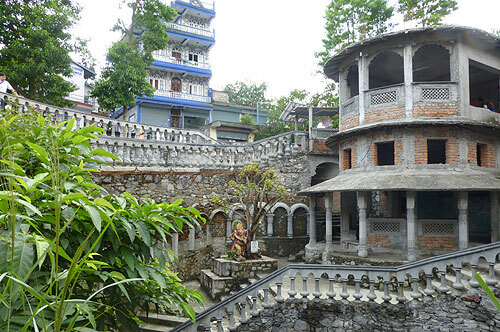 This is just across the road from the Devi Falls and lays adjacent to the Gherka Base or HQ. It's quite a compact Museum but has many artifacts from the Wars the Gherka Armies have fought and good historic information. 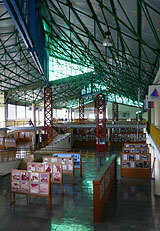 The International Mountain Museum is of special interest to those who follow the history of exploration and climbing. It's a huge modern building filled with Photographs and information regarding just about every known Master Himalayan Climber and of course, paying tribute to the countless Sherpa's who have given such good service over the years. Outside the building their is a mock up Village showing how those living in the foothills of the Mountains lived,a tall Climbing Frame and various Plants and Trees. Read more..
Pokhara sits on the edge of Phewa Lake, a beautiful place with beautiful views. Read more..
Pokhara has a sub-tropical climate, warmer than Kathmandu but it experiences quite a lot of rainfall between May and early October. Even out of the rainy season temperatures never go below 20 degrees Fahrenheit.